The first settings of the biblical account of the Passion of Christ were written during the renaissance, well before the Reformation. However, it was especially in Lutheran Germany that a tradition of the regular performance of Passions in the weeks before Easter established itself. Very few compositions of this kind by Italian composers are known. German Passions are performed regularly, not only the two extant Passions by Johann Sebastian Bach but also comparable works by other composers, such as Telemann, one of Bach's contemporaries, as well as works from earlier periods, for instance by Johann Theile and Thomas Selle. The three Passions from the pen of Heinrich Schütz belong among the lesser-known. They are relatively seldom performed, probably largely due to the fact that they are 'old-fashioned' in comparison to what was written at the time, even by Schütz himself. The New Testament includes four gospels, written by Matthew, Mark, Luke and John respectively. The accounts of Matthew and John are traditionally most often set. The first German settings are from the pen of Johann Walter, one of the main composers who worked in the spirit of Martin Luther. From 1548 to 1554 he worked in Dresden and it seems likely that his Passions were also performed there. In 1581 a set of ecclesiastical rules ordered that at Palm Sunday a Passion on the text of the gospel of St John should be sung and on Good Friday a Passion after St Matthew. This explains the composition of such Passions in the next century or so. Schütz composed his Passions in the 1660s. These included a St Luke Passion but no St Mark Passion. Although such a Passion was preserved and was sometimes attributed to him its authenticity was already in doubt when Schütz's Passions were published in the late 19th century by Philipp Spitta. About 25 years earlier a music historian already mentioned Marco Gioseppe Peranda as the composer of this Passion. This was confirmed in 1969 by the German musicologist Wolfram Steude. It dates from the same time and indicates that it had become a habit to perform four Passions during Passiontide. "The reason for this may lie in an undated reorganisation of court church services, enacted after the completed renovation of the Dresden court chapel in 1662 decreed by Johann Georg II, the ruling Elector from 1656 onwards", Christoph Koop states in his liner-notes. Peranda was born around 1625 in Rome or in Macerata. He probably was a pupil of Carissimi, as was Christoph Bernhard, who earlier was a pupil of Heinrich Schütz. Bernhard took Peranda to Dresden between 1651 and 1656. He entered the service of the court as an alto singer; it is suggested that he was a castrato. By 1661 he became vice-Kapellmeister; two years later he succeeded Vincenzo Albrici as Kapellmeister. When Schütz died in 1672 he was succeeded by Peranda as first Hofkapellmeister. Although the court was Lutheran Peranda never converted and was buried in the Monastery of Sankt Marienstern near Panschwitz-Kuckau in Upper Lusatia in 1675. Peranda was a representative of a new style in sacred music, partly due to the influences from his homeland and to his theatrical leanings. In cooperation with his colleagues Bontempi and Dedekind he composed two operas. There can be little doubt that these new fashions in music were not to the satisfaction of Schütz. "The attack on the new theatrical church music in the funeral oration for Schütz by the chief court preacher Geier was mainly directed against Peranda as a papist and as the exponent of a style described as 'broken'", Wolfram Steude writes in the article on Peranda in New Grove. However, the St Mark Passion is stylistically very close to the three Passions from Schütz's pen. The main reason was that during Holy Week the playing of instruments was not allowed in the court chapel. Therefore the four Passions are all for voices alone, without additional instruments or even a basso continuo. This lends them a strongly old-fashioned character, also because the part of the Evangelist was written in the traditional Passion tone, which was derived from plainchant. The American musicologist Daniel R. Melamed emphasizes that the Passions are different from anything Schütz has otherwise written. He was known for composing music which was strongly influenced by the expressive Italian concertato style. "But the musical types Schütz chose for his passion settings do not allow for this kind of expression either in the solo material or the choruses. The solo singing is modeled on the formulaic recitation of scriptural texts, favoring a melodic line that remains on the same pitch for many words in a row. (...) In the evangelist's narration, Schütz's principal tools are the choice of reciting pitch and the arrival on particular notes as resting places (cadence points)." In comparison Peranda's St Mark Passion is somewhat different. He uses the same Passion tone as Schütz, but the solo episodes - in particular those of the Evangelist and of Jesus - are less differentiated and narrower in compass. It is particularly the choruses which are different: they are much more modern and show unmistakable theatrical traits. Peranda also uses harmony for expressive reasons: the chorus "Kreuzige ihn" (Crucify him) includes some poignant dissonances. In the choruses the tessitura of the voices is also much wider than in the choruses in Schütz's Passions. 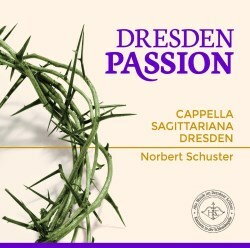 This Passion is put into its historical context by adding pieces of about the same time by Schütz and some lesser-known composers, although the compositions by Schein and Colander are of a considerably earlier date. However, I am not so enthusiastic about the fact that they are inserted into the Passion. Liturgically this is nonsense: as far as I know Passions were performed as a unity, not interrupted by other liturgical elements (unlike Mass in the Catholic liturgy). One could argue that these insertions are comparable with the arias in Bach's Passions. However, this was not practice at the time and is therefore anachronistic. Moreover, in that case the composer is the same which guarantees a stylistic coherence. That is not the case here. By inserting music of a different character - vocal music for solo voices and bc, sometimes with instruments, or instrumental pieces - the performers give the impression that Peranda's Passion cannot stand on its own feet. Some of the additional pieces have been added at an appropriate moment. When the Evangelist tells about Jesus being crucified we hear a setting of the Words from the Cross by Johann Hermann Schein, preceded by a sacred concerto by Anton Colander, Da Jesus an dem Kreuze stund (When Jesus on the cross was found). However, I would have preferred to listen to the Passion at a stretch. Fortunately the various episodes have been allocated to different tracks, so if one wants to hear the Passion at full length one can programme his CD player accordingly. Although Heinrich Schütz is pretty well-known a large part of his music is seldom performed. Some readers may not be familiar with the Kleine Geistliche Konzerte - for instance Was hast du verwirket (SWV 307) - and even less with the Cantiones Sacrae, from which collection of 1625 Turbabor, sed non perturbabor (SWV 70) has been selected. Especially interesting in regard to repertoire are the pieces by composers who today are largely unknown quantities: alongside Peranda (O Jesu mi dulcissime) Anton Colander and Samuel Seidel. Johann Hermann Schein is certainly not unknown but almost exclusively for his collection of sacred madrigals, Israelis Brünlein. The singing of the soloists is very good, although sometimes a bit too neutral. Not always the affetti in the pieces are fully explored and I also would have liked a bit more ornamentation here and there. In Schütz' motet from the Cantiones Sacrae I wonder whether the performance is a little too 'modern' as it were; this collection is largely rooted in the stile antico. The performance of Peranda's St Mark Passion leaves little to be desired. The booklet doesn't mention which of the two tenors sings the role of the Evangelist, but it is done very well. The role of Jesus could have received a bit more authority; it is a shade too lightweight. Despite my reservations about several aspects of this production I am happy with the fact that Peranda's Passion is available on disc, probably for the first time. The pieces by Colander and Seidel indicate that there is still much to discover from the time and the environment of Heinrich Schütz.